Mary Timony’s new band is a breath of fresh air. The three ladies of Ex Hex played a catchy and relaxed 10-song set of fuzzy glam-pop and even added a few songs in an encore in the first performance of their first major tour at the Black Cat Wednesday. They were extremely polished, their workmanship honed in other bands clearly on display, producing a concert experience quite unlike seeing many other new bands. And Ex Hex is sure to pick up some of that “new band buzz” in the coming month, as they are going to sneak in at least one performance at SXSW in Austin on March 12 (playing for Pitchfork at the French Legation Museum at 4pm). Meanwhile, they sold out the Black Cat’s backstage with an enthusiastic if diverse mix of alt-rockers, cuddling couples and bona-fide D.C. notables (yes, Ian MacKaye was there). It’s an impressive start out of the gate for a band that only played its first show back in October. Timony, vocalist and guitarist, looked a bit more elegant than most folks who play backstage at the Cat, and she bopped along gracefully racing through glam guitar riffs. She often crossed fretboards with bassist Betsy Wright as they faced off in a collision of sonic sauciness. Wright wiggled along to the beat, adding some punchy backing vocals to the upbeat mix and looking very spunky and punky. Laura Harris, formerly of Dischord Records’ The Aquarium, was a steady presence behind the drums, keeping reliably raucous time with successive rapid strikes of her sticks or a casual flick of the wrist when necessary. 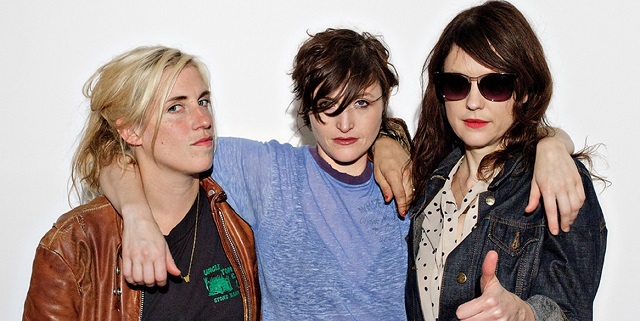 With the trio’s skill, the songs of Ex Hex come across very clearly and yet deceptively simple. Among the songs they played were the three on the band’s first 7″-inch single, “Hot and Cold,” for sale at shows in advance of its official release date of March 18. The song “Hot and Cold” ostensibly is about a deceptive or at least elusive acquaintance or love. Timony strums through it with casual ease–playing guitar comes as naturally as breathing to her–and her bandmates keep pace. The other songs on the 7-inch include “Everywhere,” a song that elicits an inescapable presence, and “Waterfall,” a slightly more frenetic number about someone you might like despite their bad habits. Their first major tour will take them down the east coast along the Gulf Coast to Texas and then through the Midwest to New York and eventually to a last stop in Winston-Salem, N.C., on April 5. It’s a perfect opportunity to catch a deft performance by a talented group of ladies before they blow up into bigger venues on their next trip around the country. Mickey reviews music shows. For recent reviews, visit Parklife DC.